I’ve had this here blog now for about two years. It’s turned into more of a blessing than I could ever have imagined — not to mention the fact that I’ve made a lot of recipe testers happy. I am grateful for what has happened and even more excited for where my baking adventures will continue to take me. And I’m grateful that you, dear friend, have come along for the ride. One of my most faithful readers (and avid recipe testers) was my grandfather. Grandpa Jim would always be willing to try whatever I made, even when I was a little girl working my make-believe Meadowside Restaurant (complete with a handwritten menu) at his kitchen table. That man would eat whatever I put in front of him, even if it looked like inedible green slop. I like to think that in more recent years, my recipes were a little more appetizing. But I never had any doubt that my grandfather would be willing to sample something I made. And I beamed at his approval. Grandpa Jim died on Friday. I was there to say goodbye to him, to hold his hand and pray for him in the last few hours of his rich, full life. There is no one in my world who can fill the void that my grandfather filled, and I am heartbroken. Even as I type this, my heart crumbles and I am reduced to a fountain of tears at the thought that I can’t give him one more recipe to try. I think he really would have enjoyed these muffins. I made these muffins at a happier time, before my grandpa was in the hospital, hooked up to cords and monitors and unconscious. I made them when I thought he’d still have a chance to eat something I’d baked, so I didn’t put much thought into deciding to make these. If I had known — if I had just known that an e-mail, a phone call, a visit, a meal I prepared would be my last with him, I would have made it more worthwhile. I would have told him how dang much I loved him, how he meant more to me than I could ever describe, how he was the most loyal, the most selfless, the most loving and caring grandfather than any granddaughter could have asked for. And I would have made him a better recipe. But I also know that, even if these muffins were made out of anchovies and gummy worms, he’d still eat them with a smile on his face and tell me how delicious they were. Because that’s just the kind of man he was. And I will never forget that kind of love. I don’t know how to end this. Endings are often messy, especially when they are so abrupt and unexpected — like ugly, jagged edges that pierce the very core of your being. I suppose all I can say is this: Love your loved ones like there is no tomorrow. Because sometimes, there just isn’t one. And find comfort in the knowledge that someone out there, near or far, loves you and what you have to give, whether it’s green slop or a plate of muffins. To them, all of it is gold. Preheat oven to 425 degrees F (375 degrees F if using a dark, non-stick tin). 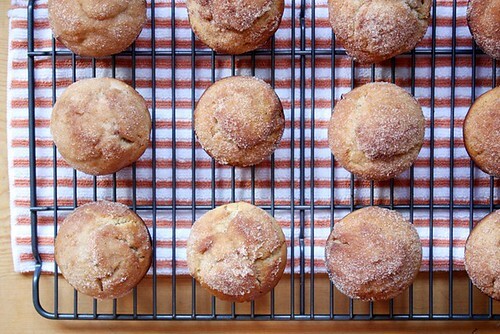 Place baking cups in a 12-cup muffin tin and lightly grease the insides. Set aside. In the bowl of a stand mixer, thoroughly whisk together butter, oil, sugars and apple juice concentrate. Add eggs, beating to combine, until mixture is smooth. Stir in baking powder, baking soda, nutmeg, cinnamon and salt. Add the flour to the butter mixture alternately with the milk, starting and ending with the flour. Stir to combine well. Spoon or scoop batter evenly into muffin cups. 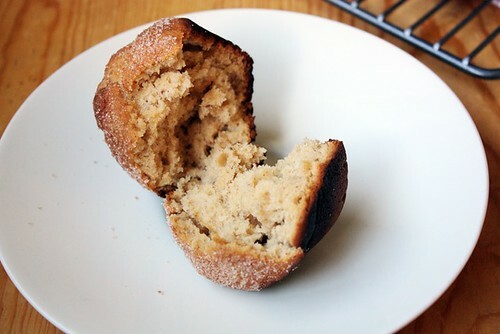 Bake until a toothpick inserted into one of the center muffins comes out clean, about 15 minutes. Remove from oven and allow to cool 10 minutes. Melt butter for topping. 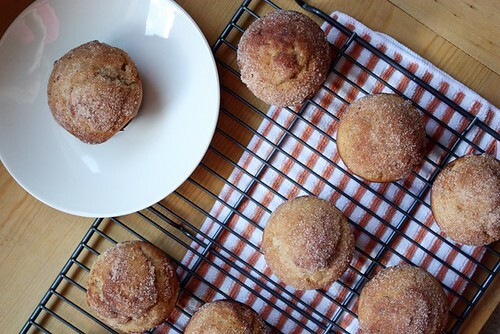 Dip the tops of each muffin into the butter, then roll in the cinnamon-sugar mixture. Place on a cooling rack to cool completely. I’m so sorry for your loss. I have only one grandparent left, my mom’s mom, and I’m so close with her it’s upsetting to even think of losing her eventually — this post is a great reminder to cherish each day. Thank you for sharing. My heart goes out to you and your family; I am so sorry for your loss. Thank you for the reminder to hold our loved ones close! I’m so sorry for your loss. It’s so tough to lose a grandparent. Cherish the memories 🙂 You’re in my thoughts and prayers. My thoughts and prayers are with you and your family. This was a well written post and it reads with a truly important message. We often take each day for granted and forget to appreciate everything else. I’ve been wondering how you were going to write a blog post after this week. You did it just the way you do everything–with class and warmth and truth. I’m so proud to call you my best friend. Love you sweets. Can you hear the sobbing all the way over here? Grandpa LOVED not only your baking but your ability to be so creative in your writing. I, too, am glad that when the time was right you were at his side with us and it was truly the right decision. And, you are absolutely right in that he ate EVERYTHING you made. I think the Susie Bake oven “stuff” was his favorite. 🙂 He loved you with all his heart which is why I think he waited for you. What a gift you gave each other. I love you! I miss you! And I will tell you that every chance I get. Good grief, Mom, now can you hear MY sobbing? 😉 Love you too!! This is a dear posting, Stephanie. I am a lucky woman who got to enjoy your Grandpa’s company on our recent trip to Africa. I will always be grateful for that wonderful trip. There is no doubt in my mind that this lovable man, along with your mother, put this trip over-the-top for me!! It is easy to understand something of the size of this loss for his family. I am so grateful for knowing your Grandpa. Sue — Thanks so much for the comment! I’ve heard a lot about you: All good things of course :), including that you were an incredible fast friend to my mom and grandpa while in Africa. I’m so glad he was able to join you all on that trip this summer; it sounded like he had an unforgettable time and was equally grateful for the good company. You are so blessed to have had the wonderful relationship you had with your grandfather. I, too, had a unique, special connection with my grampa which was reinforced when he passed away one night while I was alone, caring for him. It took a long time to fully convert my pain and loss to strictly joyful remembrances. I think it happened when I realized I lost his physical being but not his spirit. I’m sure you still feel your grandfather’s presence about you with every new recipe you explore because he is with you supporting you as always. In your heart he lives on <3 I just found your site today, but greatly look forward to trying your recipes. God be with you.